There is just so much diversity in Australian birds. 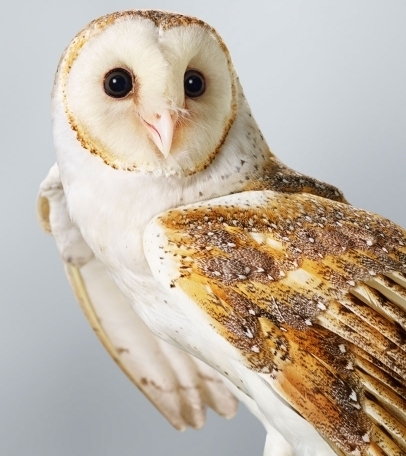 Some birds of prey are typically stern and formidable, while others are shy and affectionate. … This series does have some colourful characters like Pepper, a gorgeous Southern Boobook Owl who was rescued and rehabilitated, yet continues to return to Broadwings every time she is released; a cheeky Kestrel called Bandit with a penchant for stealing tea bags; and a rescued Goshawk called Trinity, a victim of habitat destruction as a result of land clearing; plus many more. I photographed the series with a large format Phase One camera so the detail captured is stunning and I print my artworks at human size so that they can be appreciated as equals. I think that if you stare into the eyes of a regal bird of prey you begin to feel a deeper connection and understanding of the species.